This book makes explicit connections between young children's spontaneous repeated actions, and their representations of their emotional worlds. 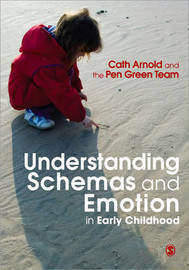 Drawing on the literature on schemas, attachment theory and family contexts, the author takes schema theory into the territory of the emotions, making it relevant to the social and emotional development strand in early childhood education. Based on research carried out alongside children, parents, workers and co-researchers at the world-famous Pen Green Nursery, and using case studies of a small number of individual children, the author shows new links between cognition and affect. The book includes a brief summary of a method of Child Study, using video and reflections on video sequences. This book will be of interest to students and practitioners on Early Childhood undergraduate and postgraduate courses, as well as those taking modules on schema theory. Cath Arnold will be discussing key ideas from Involving Parents in their Children's Learning in the SAGE Early Years Masterclass, a free professional development experience hosted by Kathy Brodie. To sign up, or for more information, click here.